"It's time to admit that unilateral steps don't work," says Jewish Home chairman as he officially presents his annexation plan. 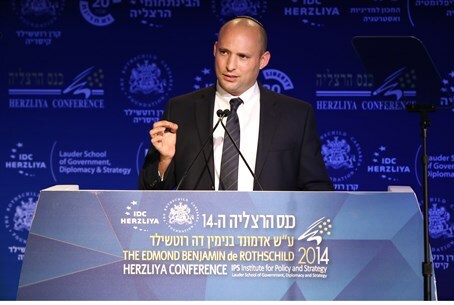 Economy Minister and Jewish Home chairman Naftali Bennett officially presented his annexation plan during a speech at the Herzliya Conference on Sunday. Under the plan, Israel will gradually annex Area C of Judea and Samaria, where 400,000 Israelis reside alongside some 70,000 Arabs, while creating an enhanced autonomy in the remaining areas with full freedom of movement. The first area to be annexed would be Gush Etzion, an idea Bennett recently brought up during a speaking appearance at the Bar Ilan University. The second part of the plan includes offering Israeli citizenship to 70,000 Arab residents living in the areas to be annexed, resulting in 1.77 million Israeli Arabs instead of 1.7 million today. “With the formation of the Hamas-Fatah government, we must recognize the truth - the Oslo era is over. After 21 years of trying one way which included unilateral withdrawals, concessions, releasing terrorists, disengagement and a unilateral separation - it's time to admit that it does not work,” said Bennett in his speech. "We discovered that when you run away from terror and throw away the keys - the terrorists come after you. We left Gaza, and thousands of rockets are falling on us today,” he continued. "It’s time to think creatively how to build a better reality here for the citizens of Israel and for the Arabs residing in Judea and Samaria,” added Bennett, referring to his annexation plan. Bennett went on to attack the false hopes touted by the left for years. Bennett has long advocated for sovereignty over Area C of Judea and Samaria, which contains all the Jewish communities, most notably in a viral video released shortly before his election to government. He recently drafted a letter to Prime Minister Binyamin Netanyahu, demanding that Israel establish full sovereignty over "settlement blocs" in Judea and Samaria. The demand came after the Palestinian Authority (PA) violated the Oslo Accords by taking unilateral action and applying for membership in fifteen different international organizations.